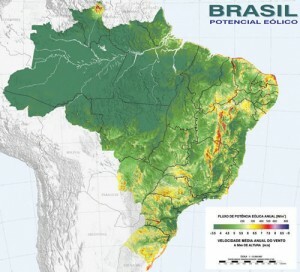 Agência Brasil reports that Eletrobrás‘ Energy Research Center (Centro de Pesquisas de Energia – Cepel) is preparing a new national wind atlas for release in late 2010. Researchers feel that the existing wind atlas, prepared in 2001, may have greatly underestimated Brazil’s potential for electricity generation through wind. At that time, the potential was estimated at 143 gigawatts (GW), whereas preliminary estimates now place it at 250 GW or more. The prior effort used mostly satellite data and estimated potential at 50 meters altitude (the common wind tower height at the time) using mathematical formulae (rather than actual measurements). The new atlas will include estimates for wind potential at 50, 90 and 100 meter heights. The existing national wind atlas can be found at this link. In addition, in recent years state-focused wind maps have been prepared for Alagoas (AL), Bahia (BA), Ceará (CE), Espírito Santo (ES), Paraná (PR), Rio Grande do Norte (RN) and Rio Grande do Sul (RS). Another is under preparation for the state of São Paulo, and RS just announced that it will soon update its wind atlas. The existing links have been added to the Temas Tools page pointing you to all the known wind maps for Latin America and the Caribbean (LAC), as will all new ones as they emerge in coming months, so check that page often!